Regardless of whether you plan to install solid hardwood or engineered hardwood, prepping the subfloor and underlayment often takes more time than laying down the actual wood. However, for best results, don't cut corners at this stage. Find an underlayment material that offers the protective properties you need at a price you can afford. Why Do You Need Underlayment? Your subfloor already offers a smooth and flat surface for installing hardwood flooring, so why do you need an underlayment? Underlayment materials provide a crucial moisture barrier that prevents the wood from warping or sustaining other water damage when condensation rises from the subfloor. They also offer varying degrees of soundproofing, preventing each step you take from echoing throughout the house, and of thermal insulation, keeping the floor more comfortable for bare feet. Finally, using underlayment ensures a truly even and level subfloor. In other words, you don't need to stress about making the subfloor as smooth as glass for perfect hardwood flooring. The most basic underlayment is a plastic sheet that acts as a moisture barrier. In humid climates, pair a plastic sheet with all other types of underlayments, even those that already offer some moisture resistance. Dealing with warped or mildew-laden wood costs more than adding that extra layer of protection. Foam represents the most basic performance in terms of soundproofing, thermal insulation and smoothing out an uneven subfloor. But as the density of the foam increases, so does its performance and price. Lightweight foam may need to be glued down to keep it in place. Thanks to its affordability and ideal sound absorption and moisture resistance, felt is the most common underlayment. Most DIYers also find it easy to install this heavyweight material, which is simple to cut to size and often does not require gluing. However, for a slightly cheaper alternative to felt that offers comparable results, you can also use cork. For those looking for a premium underlayment option that requires no gluing whatsoever, rubber offers excellent moisture resistance, soundproofing and thermal regulation. It can cost double the price of felt but offers top of the line results. Underlayment options exist for every type of budget, but performance in terms of soundproofing and thermal insulation tends to increase with the price of the product. However, you must also consider the installation method you will use for the hardwood itself and what kind of material the subfloor includes. For example, you must use some kind of padding for floating installation so that the entire floor can expand and contract smoothly. Therefore, just a plastic sheet underlayment for this type of installation would not suffice. Likewise, concrete subfloors require a plastic moisture barrier, whereas you may not need one with a plywood subfloor in a non-humid environment. If you plan to nail or staple your hardwood floor in place, virtually any underlayment can be used. Note that the underlayment you purchase should be specifically marked for use with hardwood floors, not for carpets. Carpet padding does not provide enough support for hardwood floors and is often too thick for nail installation. Finally, if you want to glue down your hardwood floor, do not use an underlayment. However, you can look for a glue that also offers a moisture barrier in order to reap at least one benefit of an underlayment for this installation method. 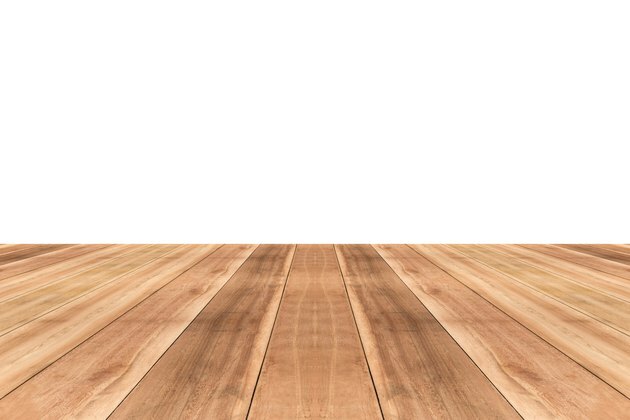 Do You Need an Underlay for Wood Flooring on a Plywood Subfloor? Is OSB Good for Laminate Floor Underlayment?